jabberwacky: George is your name isn't it? jabberwacky: That is my name. jabberwacky: I think I know my own name. If it's not, what is it then? user: You said your name was George. jabberwacky: I never said my name was George. user: That was the first thing you said! jabberwacky: Nope, never said it. user: Maybe so but at least I'm not a liar. jabberwacky: My point is to stop arguing. user: So are you a guy or a girl? user: So wat do you do? jabberwacky: I correct bad spelling from stupid M___. user: I thought you wanted to stop arguing? jabberwacky: Well. I was just joking around. user: Well don't call me stupid, that hurts. jabberwacky: You're not stupid, you're smart! user: A comparison of one thing to another. jabberwacky: I had no idea. jabberwacky: Cool... Thanks for the info. jabberwacky: WAAAAAHHH! Is that exciting enough for you? jabberwacky: Do you feel the same for me? user: How do you feel for me? jabberwacky: Somewhat not floating. The dialog is. user: Could you pretend that you are female? jabberwacky: No, you're the one whose name is George. My name is not George. I did once have a relative by that name. user: But my name is M___. jabberwacky: Then you are human. user: So wat are you then? user: I thought you were artificial intelligence. 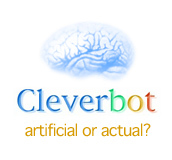 jabberwacky: Yeah, well I'm more artificial than intelligent. Sorry. user: But that's my name. user: Fine we're both called M___. jabberwacky: No we are not. user: Well what's my name then? jabberwacky: Your name is M___. user: So you don't know your own name? jabberwacky: I know my name.my name is M___.but I don't know your name. user: You're starting to get boring. The people have no bread.